We're big fans of the Communion Records-led Bushstock Festival, now entering its fourth year of bringing ace new bands to the Shepherds Bush area of London. They've seen the likes of Daughter rise from early on the bill (2011) to being one of the main draws (2012), as well as shepherding (ahem) the likes of Bastille (2012) and Thumpers (2013) to bigger climes. Here's a selection of bands that we urge you to investigate at this fine multi-venue festival. Some bands just have that "festival band" vibe and we suspect that this Nottingham lot will fit that description best at this festival. Debut single 'Noah' signalled their intent, so expect a glut of anthems. Norway's Kari Jahsen delivers haunting folktronica - a perfect example of the different genres that Bushstock covers. She's collaborated with Tuung, and we're intrigued to see what she can offer in the live environment. The Ascot trio can count themselves unlucky that they weren't part of our final three selections for this year's Glastonbury Festival Emerging Talent Competition - one of our choices being another Bushstock attendee, Fickle Friends - but their dark, experimental pop is something we certainly hope to check out in person. We used to follow LAYLA in her previous guise as Jose Vanders, even bigging her up as one of our tips for 2008. It didn't quite work out for her then but she's making a resurgence, and we're intrigued to see how this singer-songwriter has progressed in the intervening period. Honestly, we've never been that terribly excited by BBC Sound Of 2014 longlisted nominee Luke Sital-Singh. He's clearly talented but we've felt there's been something missing - that gap could be filled by the London Contemporary Voices choir at Bushstock, who will be joining him onstage. We're guessing/hoping it'll be a bit like 'Sister Act'. Maybe 'Sister Act II'. Mixing a rousing Mumford & Sons-esque sound with the vocal hooks of Bastille should have equalled near instantaneous success for the London quartet but their rise has been much steadier. We're expecting big things from them generally but a strong performance here would be a good start. We've been increasingly impressed by RHODES, having caught him in underwhelming circumstances at The Great Escape last year - far from his fault, we must strongly add. Entrancing recent EP track 'Your Soul' suggests an artist preparing for the big leagues. 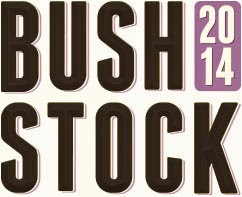 For more information and to purchase tickets, head to bushstock.co.uk.